Facing a cash crunch because his work hours were cut, they sought help from PNC Mortgage while they were still current on their payments. At its suggestion, they met with a housing counselor who helped them get a trial loan modification, and they made all the payments on time for 13 months. They also followed the advice of housing counselors to set aside money left over, putting off home and car repairs, while they waited to learn whether their reduced payment plan would be made permanent. This month, their application was denied, meaning their home is likely headed to foreclosure. The bank's reasoning? The family's $7,160 in savings, including a $5,218 income tax refund, accumulated during the year it took the bank to review the application, meant they were too well off to qualify. "I was just following whatever they said to do," a choked-up Huerta, the father of two young boys, said last week. "I'm not looking for something for free. I'm just looking for a payment that can save my family." Like Huerta, the frustrations of the past year have caused red-rimmed eyes among counselors working on their file, because they just don't understand how a family like Huerta and Soto's can be turned away. "These are the very borrowers you want," said Liz Caton, director of counseling services at the Northwest Side Housing Center. "These are the homeowners who have jobs, who are working on budgeting and saving. It seems to be a no-brainer when you ask the question is it in (the bank's) best interest to help this homeowner or not." It was with high hopes that President Barack Obama announced the Home Affordable Modification Program in early March 2009 to assist honest homeowners who were working but struggling. Almost 20 months later, the program has gone through many revisions and been labeled a failure by critics. Huerta and Soto's story illustrates how the best intentions of homeowners to hold up their end of an agreement can work against them in a system overwhelmed by demand and strained by capacity. In recent weeks some of the nation's biggest lenders have suspended foreclosures amid allegations of sloppy paperwork and legal shortcuts. Huerta, who remained positive during the first eight months of the ordeal, has now lost all faith in the system but he remains resolute. "I'm not going to leave my home," he said. A spokesman for PNC said the bank cannot comment on a particular customer. "PNC wants to help as many customers as possible to remain in their homes, and is committed to helping maintain mortgage affordability," the bank said in a statement. "Since the inception of HAMP, we have significantly increased our dedicated loan modification program staffing to offer assistance to our customers. We proactively work with struggling homeowners to find a permanent solution to resolve delinquency and mitigate loss." In recent months, Treasury officials have urged loan servicers to speed the processing of applicants who are in "aged" trial modifications. As of August, more than 94,000 homeowners nationally were like Huerta and Soto, still waiting six months or more to hear back on their applications. "These are the ones where people have been through the wringer," said Laurie Maggiano, director of policy in the Treasury Department's Homeownership Preservation Office. "We are very sympathetic to borrowers who have been dragged through the mud for many months." 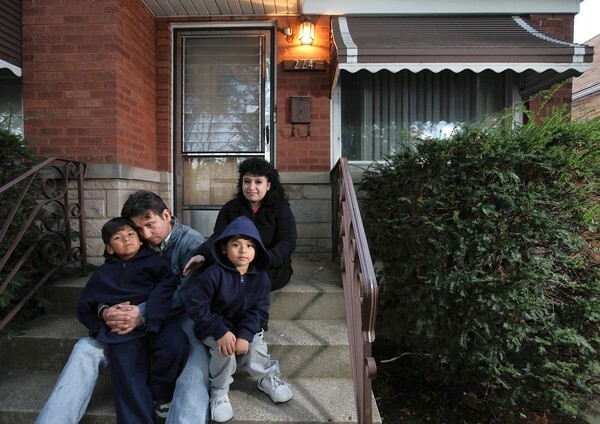 A year ago Huerta, 32, and Soto, 35, were current on the $1,541 monthly mortgage for the home they bought in 2003 for $178,000, but when his job as a machine operator was transferred to Grayslake, the increased commuting expenses cut into their savings. Then his hours were cut, from 40 hours a week to 32. Soto works as a hotel housekeeper, but only on weekends so they don't have day care expenses. The couple tapped their savings to pay the mortgage but Huerta knew that was a temporary fix. A PNC customer representative suggested they contact a housing counselor certified by the federal Department of Housing and Urban Development. Huerta and Soto applied for, and received, a HAMP trial modification with a payment of $948.46 that started in October 2009 and was to last for four months while their file was reviewed. As the months stretched on, some trial payments were rejected by the bank and returned to Huerta. Each time Huerta would call the bank, and a representative would take his payment over the phone, using his debit card. Caton, their housing counselor, said her advice was, "Make your payments. It's the bank that's messed up, not you.'" One time as he was trying to understand one of the many letters the family received from PNC, Huerta, who is fluent in English but more comfortable speaking Spanish, asked if he could speak to a Spanish-speaking customer representative. He said he was placed on hold, listening to music, for an hour, before he finally gave up. The strain, meanwhile, started taking a toll on the family. The couple traditionally sat down with the boys, David, 7, and Richard, 6, at the kitchen table every night while they did homework. But on many days after work, Huerta was driving back and forth to the housing counselor's office, taking more documents to send to PNC to prove his financial standing and need for a modification. The good-natured father who happily coached his sons' soccer team was replaced by a frustrated man who was aloof at home. "They were always coming back, asking for the same information," Soto said. "It's hard. I see my husband break down. There's been tears. It's one letter after another. It has broken our family situation." Huerta doesn't disagree with Soto's assessment. "I don't want to see nobody," he said. "I never fight with my wife before this situation. Now we fight more. I go to my computer and sit there three, four hours. My kids playing, it just bothers me." Meanwhile, Huerta and Soto were afraid to spend money on needed car repairs and home maintenance. A $5,218 income tax refund went into their bank account while a broken window at their home remained unfixed. "I was saving the money I can," Huerta said. "My checking account started going back up." Said Caton, "We tell all of our homeowners, 'You need to budget, you need to save,' and Rogelio took it seriously." On Sept. 27, Huerta sent in the October trial payment, the 13th payment of its kind, and it was accepted. The rejection letter, listing the reason for the denial as "asset review determination" was dated Oct. 7. In follow-up conversations with PNC, counselors said they were told that if Huerta and Soto had saved about $2,500 less, a permanent modification would have been granted. A spokeswoman for the Federal Housing Finance Agency said computer models help determine whether a borrower who is less than 60 days behind on a mortgage is in imminent danger of default.